This week I’ve been impatient and I thought, hey, this sounds familiar. Turns out, it is, familiar, I mean, to me, this impatience thing, the jitteriness that makes me forge an inability to wait for the good stuff like a toddler struggles to wait to for the loo. Rubbish analogies aside, while I now approach the end of edit number 3 of my second novel, I looked to my blog to trawl for posts on impatience and happened upon this one. The reason I like it isn’t just because it’s a memory road trip for me on self-publishing my first book, but it contains a very funny, real anecdote about me, basically, getting into the wrong car. So, if you’re getting fed up with the pace of how your work is going, my message is this: hold on. Get stuck in and keep going. Just don’t get into the wrong car. Last week I had a cold, this week I have the sulks. Don’t get me wrong, we’re not talking toddler tantrums here, we’re talking a mild, lingering bottom lip, and like a case of bad flatulence, it won’t shift. The reason for my dedums is simple: I am impatient. ‘You’re not checking your book sales again, are you?’ my husband asks as he sticks his head around the study door. I attempt to cover the screen with my palm, but, like a News of the Word Editor in a court room, it is useless. At this juncture, I must tell you a little story. As I said, I am an impatient sort. I want things to happen pretty much immediately, not only in work, but in almost all aspects of my life. Learning patience – after cooking for kids and understanding what’s happening in The West Wing – is the singularly most difficult thing I have learned to do. So, to the story. One day, let us say three years ago, we were returning from a family trip to Wales to visit my husband’s grandmother. At the time our girls were aged 7 and 5 and at an age when we needed to stop at the delightful motorway services for a nature break or three. My bladder never quite being the same after two babies (sorry, men folk), I also needed to stop. The girls having now falling asleep, we agreed that I would nip out to use the facilities and run back. Now, I don’t know about you, but do you know that dream when you are walking somewhere and then you look down and you are completely naked, in the nuddy, and you feel a wave of mortification wash over you? Can you recall that feeling? Well, this feeling is what came over me when, glancing from the corner of my eye I notice that the car seats in the back are different to my girls’ seats. Strange. And then my eyes fall to the seat covers – leather. What the? Ours are fabric. And then it hits me. I am in the wrong car. The wrong car. I look up to see a man, mid-forties, balding, frowning, staring at me, mouth agape, finger, probably, hovering over 999. ‘OhmigodI’msorry!’ I blurt, and, faster than you can say, ‘naked dream’, I am out of that car and breathing like a phantom caller in a film sketch scanning the parking lot like a crazy woman. When I eventually locate our family car, my husband and girls are in fits of laughter, the whole sorry episode not having missed their unforgiving eyes, and it has made their day. ‘Mum got into a strange man’s car!’ they yelp. ‘Just drive,’ I mutter. But it is a good five minutes before we can leave because my husband is laughing too much for his eyes to focus. But, if we re-edited, it would mean that I could begin to submit The Boy Who Played Guitar to book review blogs, just like the amazing Amanda Hocking did to publicise her book. At least then I would be actively doing something to promote it and then perhaps I could calm down. He smiles at me. ‘So you’re feeling a bit better then, a bit happier?’ I consider this. I am lucky to do what I do, I tell myself. It could be worse – at least I am not a Chilean coal miner or the Greek Government, say. ‘Yep. Happier. I know I just have to wait a little longer for it all to work out.’ He jumps up. ‘That’s great,’ he says, ‘I’ll check on dinner.’ ‘What?’ I say, ‘you mean it’s not ready yet? How long does that oven take? Come on!’ My husband sighs and reaching down, hands me some chocolate. Diary of a hopeful author: I’m donating my book royalties to Comic Relief! This week is a different kind of post. 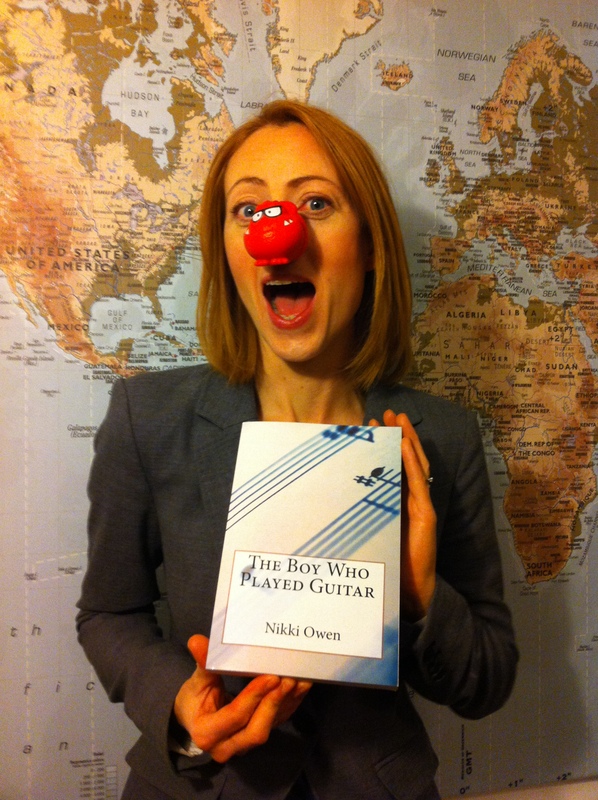 Because this week I’ve announced that I am to donate all the royalties from my book, The Boy Who Played Guitar, to the charity, Comic Relief. Yup, between now and 29th April, 2013, every time my book – a contemporary fiction novel – is sold, the royalties will go to raise vital funds to help people across UK and Africa who live unimaginably tough lives. Me, my Red Nose Day nose & my book! Read & raise, people! You can buy my book two ways: in paperback and for Kindle. I’ve stuck the links below for you to follow. Ooo, and just to reassure, it’s a great read – 5 star rated on Amazon. Quick synopsis: Tired teacher starts a choir to help troubled students get their grades, but things don’t quite work out the way he planned. It’s funny & sad all at the same time. Once the royalties are gathered, as well as writing (hopefully a huge) cheque for Comic Relief, I’ll report back to you on the blog about how it’s all gone. In the meantime, if you can tell as many people as you can about it, if they could buy the book, too, it means we’re generating more funds, helping more people out of poverty. Spread the word! I’m calling it ‘Read & Raise’ and in advance, a MASSIVE than you for reading and raising with me to make people’s lives better. The Boy Who Played Guitar is also avaialble via Amazon Europe. All royalties to Comic Relief. Well, it’s all nearly over. We’re a coming to Christmas and, writing wise, it’s time for me to fess up and tell you if a) I’ve hit my deadlines or b) I’ve not even come close. It’s kind of evaluating, if you will, how I’ve done and, most importantly, whether I’ve completed what I said I would (stay with me). Evaluating is like the grandfather of writing. It sits in a corner of the room, grumbling and for the most part, you don’t notice he’s there until he pipes up something profound – or a profanity, which ever comes first. Evaluating is profound. When you evaluate your work and the effort you put in, you begin to realise things. Things about yourself, who you are, what makes you tick. Evaluating is the wise bit, the bit that you sit back and think, did I do a good job? It makes you assess what you do well, and what not so well, so that next time round you can apply it all and become even more awesome. This week I’ve been evaluating a whole heap. I’ve looked at what I’ve done in 2012 writing wise and pondered if I’ve done a good job. It’s been scary. I took a massive punt at the start of the year, because back in January, I was working as a marketing consultant and a copywriter. 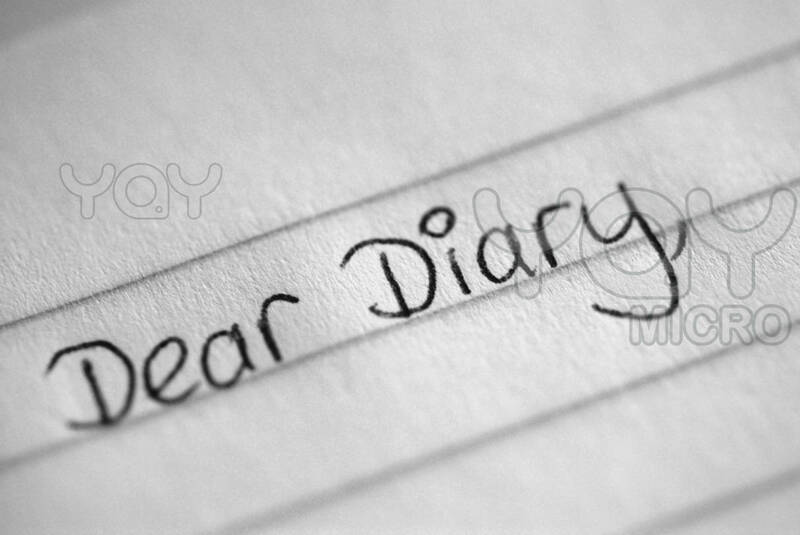 I have always written. Always. That’s all I wanted to do. I was feeling low. I wanted to do a job I loved because, quite frankly, life’s too short to waste it. I didn’t mind marketing, I was pretty good at it, but it wasn’t enough. And so, after a heart to heart with my other half, I decided to take a huge risk and throw all my delicate eggs into one writing basket. I was going to be a full-time writer. It’s been hard at times, but it’s been worth it. Hell yeah. 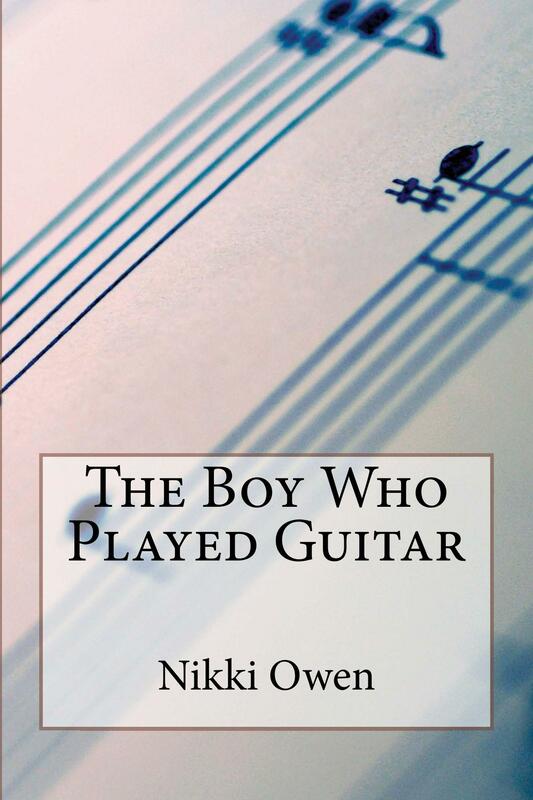 On a whim, after a particularly low point, I thought, ‘Oh sod it,’ and stuck my book, The Boy Who Played Guitar, on Amazon and I nearly fell over when it started to sell and got great reviews. I bagged the Gazette column job, then the Citizen and Echo Weekend columnist gig. There’s been a bit of radio, some invites to cracking things. And then there’s the second book. If I evaluate this all grandfather style, I’d say I guess I haven’t done so bad. But there’s so much more to do. New Year is all about fresh starts, and I think my 2013 will go for it. A book on the shelves, more newspaper work. Heck, a national would be great. Who knows. I do know it’s been hard work but heck if it’s not worth it. I love this job. Love it. That’s my evaluation. My evaluation would come and pat me on the head, give me a hug and say keep going. Keep going. One to remember for us all come 2013. We gotta keep on going. This is my last Wednesday post for 2012. Huge thanks for reading all my waffle this year – I am truly honoured. See you in 2013. Merry Sherry Christmas and a cracking New Year to you! At this juncture, I must tell you a little story. As I said, I am an impatient sort. I want things to happen pretty much immediately, not only in work, but in almost all aspects of my life. Learning patience – after cooking for kids and understanding what’s happening in The West Wing – is the singularly most difficult thing I have learned to do. So, to the story. One day, let us say three years ago, we were returning from a family trip to Wales to visit my husband’s grandmother. At the time our girls were aged 7 and 5 and at an age when we needed to stop at the delightful motorway services for a nature break or three. My bladder never quite being the same after two babies (sorry, men folk), I also needed to stop. The girls having now falling asleep, we agreed that I would nip out to use the facilities and run back. Now, it is important to point out here that I was , even then, in the iron-grip of writing and had a deadline to meet for a Guardian travel writing competition. Needless to say, I was keen to get out and get in with maximum speed and with my skirt not in my knickers. All goes well. I run in, do what I need to do, and then, my mind on the Guardian job, I sprint out of the automatic doors and into the car park. Scanning the cars, my impatient autopilot kicks in, and, spotting our red Freelander, I peg it over and, hauling the door open, throw my self on to the passenger seat panting, ‘Come on! Let’s get a move on!’ Now, I don’t know about you, but do you know that dream when you are walking somewhere and then you look down and you are completely naked, in the nuddy, and you feel a wave of mortification wash over you? Can you recall that feeling? Well, this feeling is what came over me when, glancing from the corner of my eye I notice that the car seats in the back are different to my girls’ seats. Strange. And then my eyes fall to the seat covers – leather. What the? Ours are fabric. And then it hits me. I am in the wrong car. The wrong car. I look up to see a man, mid-forties, balding, frowning, staring at me, mouth agape, finger, probably, hovering over 999. ‘OhmigodI’msorry!’ I blurt, and, faster than you can say, ‘naked dream’, I am out of that car and breathing like a phantom caller in a film sketch scanning the parking lot like a crazy woman. When I eventually locate our family car, my husband and girls are in fits of laughter, the whole sorry episode not having missed their unforgiving eyes, and it has made their day. ‘Mum got into a strange man’s car!’ they yelp. ‘Just drive,’ I mutter. But it is a good five minutes before we can leave because my husband is laughing too much for his eyes to focus. Back in the study and my mind in a work muddle, I break up the fugg by going for a run to clear my head. Showered and back at my desk, I decide to look through my marketing notes for my book The Boy Who Played Guitar. On it there is a post-it note with my writing scrawled on it. I squint (even I can’t read my own writing it seems). The note says: ‘Re-edit book. Get friend to help.’ And it comes back to me. A friend of mine read The Boy Who Played Guitar and loved it – even said she prefered it to David Nicholl’s One Day, to which I choked on my Mars Bar. Crucially, she said that she would be happy to re-edit because my proof reading skills are almost as bad as my patience skills (Oh keep up alredy! See?). Not that there is much wrong with the first version – just the odd mistype here and there (it’s only 99p…) But, if we re-edited, it would mean that I could begin to submit The Boy Who Played Guitar to book review blogs, just like the amazing Amanda Hocking did to publicise her book. At least then I would be actively doing something to promote it and then perhaps I could calm down. That night, me and the hubbie catch up. ‘How was your day?’ he asks. ‘Oh, I got another chapter of my next novel written. I’ve only got five chapters to go now.’ ‘Wow,’ he says, ‘how many words have you written now?’ I think. ‘67,000, roughly.’ We sit and stare out the window as the number count lingers in the air. ‘Oh,’ I say, ‘and I’m re-proof reading The Boy Who Played Guitar so I can get it back out there.’ He smiles at me. ‘So you’re feeling a bit better then, a bit happier?’ I consider this. I am lucky to do what I do, I tell myself. It could be worse – at least I am not a Chilean coal miner or the Greek Government, say. ‘Yep. Happier. I know I just have to wait a little longer for it all to work out.’ He jumps up. ‘That’s great,’ he says, ‘I’ll check on dinner.’ ‘What?’ I say, ‘you mean it’s not ready yet? How long does that oven take? Come on!’ My husband sighs and reaching down, hands me some chocolate. My mind’s gone blank. I’m sat here at my computer and I can’t think of a thing to write. That’s what happens to my head sometimes, long periods of tumbleweed where I can’t think of anything to say and then when I do say something, it turns out to be complete bobbins. As it goes, this is what also happens to me when I listen to myself speak on the radio. A couple of weeks ago I was interviewed by the lovely Claire Carter for the BBC Radio Gloucestershire Breakfast Show – and this week it’s airing, every day, 5 mornings a week. Oh dear lord. ‘Who-hoo!’ screeches the youngest, dive-bombing onto our bed. ‘Ouch!’ I cry. ‘That was my stomach!’ Apologising, the youngest catapults herself in between me and my half-asleep husband and settles down for a listen. ‘Turn it up, dad. Mum’s on in a minute.’ ‘Whhaaaaaaaa!’ comes another yell, this time from the direction of the room of the eldest, the door crashing to the wall as she belts in and belly flops on the mattress. ‘Bloomin’ heck,’ mutters my husband, ‘it’s like WWF in here.’ Ignoring the fact that the coffee I am holding has just spilt all over the sheets, we turn up the radio and settle down to listen. Now, I don’t know about you, but there’s something about listening to the sound of my own voice that I just find, well, cringey. I’m originally a Dublin lass, but when I was about 5, we sailed the boat to Liverpool and with my mum, dad, sister and new baby brother, we set up home in Leyland, Lancashire, and overnight, I became a fully paid up Northerner. Since my childhood, I have moved about a far bit. I went to University in Liverpool, mixing my voice into the melting pot of accents from all over the UK. Later, I worked in Manchester, moving down to Bristol with my Southerner husband, eventually settling in the Cotswolds surrounded by a mix of the Queen’s English on one hand and the farmer’s on the other. And so, when we sit in the bedroom and hear my voice, I am quite surprised. ‘Mum,’ says the youngest, ‘that doesn’t sound like you.’ We all lean into the radio. ‘She’s right,’ says my husband, sitting up, ‘it doesn’t.’ We all nod. ‘You sound nice, mum,’ says the eldest. ‘What,’ I say, ‘like I don’t always sound nice?’ The ensuing silence speaks volumes. And so, each day this week, in the ‘Thought for the Day’ slot, I am hearing my voice on the radio talking about Gloucestershire. Some days I sound right northern, others I swear I could be from the south, but each time the things that I am talking about come across, well, okay, really. I return home later that morning and switch on the radio only to catch the second slot of the day at 8.45a.m. where they repeat my thought of the day from the earlier 6.45am slot. The thing that really touches me this time though is the presenter, Mark Cummings. Because, even though he doesn’t have to, when he introduces me he talks about my writing, mentioning my e-book, The Boy Who Played Guitar, by name. It makes me stop and think, about how nice people are sometimes and how, even when you don’t ask, they will do something for you, something that can help, something that can make all the difference. ‘Do you know,’ I say to my husband later that evening, red wine in hand, ‘when this week of radio interviews have aired, I’m going to send a thank-you email to Mark and Claire at BBC Gloucestershire. They’ve been so good to me, mentioning my book, tweeting about me, all sorts.’ My husband puts his arm around me and gives me a hug. ‘And they’re running your main book interview this week, too.’ My bottom lip wobbles. ‘Look,’ he says, ‘it’s because you’re so nice, honey, that’s why they do these things.’ I start to cry. ‘You okay?’ he asks. I nod and wipe my nose. ‘Wouldn’t it be great,’ I say, ‘if it all worked out and I really could make a living out of writing.’ He smooths back my hair. ‘What would you write about when you make it there?’ he says. I open my mouth to say something and then frown. I take a swill of wine. ‘What were you going to say?’ asks my hubbie. I shrug. ‘I’ve completely forgotten. My mind’s just gone blank.’ He sighs and we stick the telly on. I need a cup of tea. Last week I was clumsy, this week I’m tired. For the past few months I’ve been getting up at 5 a.m. again to write – and I think it’s taking its toll. Writing in the morning helps reassure me for the day because if other work takes over later on, at least I know that I’ve put an hour’s worth of writing on to the page. The thing is, I am now absolutely shattered. ‘You look tired,’ says my friend one evening as we go for a fast walk in the late sunshine. ‘I know,’ I yawn, ‘but it will be worth it.’ She narrows her eyes at me and stops walking. ‘Look,’ she says, her serious teacher face on, ‘you don’t need to push yourself quite so hard. Maybe move your deadlines back a bit.’ I rub my eyes and nod before we resume our exercise in the fading light. The next morning, I take a quick look at Karen’s other top ten tips and try to see if I am already achieving some of them. ‘Know how to negotiate.’ Hmmm, I can get the eldest to have only one digestive biscuit instead of two, so, tick! ‘Have the courage to take a risk.’ Okay, so I did contact the Gloucestershire Gazette about writing a column, and I did try a raw scallop once, so yeah, I do risks, so, tick! ‘Plan to win.’ Hmmm…I stand and think. ‘Plan to win,’ I say out loud. My youngest must hear me as she rushes in shouting, ‘Who won? Who won? What did you win mum?’ When I tell her nothing, she drops her shoulders and sulks off. I flop into my seat. Planning to win is not something I normally do. Planning to juggle, yes. Planning to get my roots done one day soon, definitely. But win? It seems almost arrogant – and certainly alien – to think such a thing about myself. But I realise Karen’s advice is right. If I don’t plan to win, how will I ever, you know, win? Feeling a bit tired by all the thinking, I get up, get the kids to school and return to the house to find my mobile buzzing – it’s a direct message for me via Twitter. Clicking it open, I read it to see it’s from a radio presenter at BBC Radio Gloucestershire, Claire Carter – and she wants to do an interview…about my book The Boy Who Played Guitar. Frozen to the spot, my heart bangs in my chest as Claire and I then proceed to send a string of messages to each other, the upshot of which is that she is coming to our house the next day to interview me. I immediately phone my husband. ‘Wow! Nice one, honey,’ he says. I let out a breath and say, ‘You do radio. Will you give me some pointers?’ He readily agrees and I am very grateful (he, the media tart, loves the radio, and does the BBC Radio Gloucestershire Business Briefing almost every week. He does TV interviews, too. Our kids now think he is famous. I know.) Next, I phone my mum. ‘Proud of you!’ she shouts. Then, finally, I phone my friend. ‘Jesus!’ she shrieks. ‘You’d better wash your hair.’ I nod. ‘And the kitchen sides,’ she says. ‘Wipe down the sides!’ I thank her – she is an oracle of advice. While I am nervous to start with, the actual interview goes really well. Claire is lovely, so chatty and friendly, and we bond over talk of cuppas and fake tans. The interview doesn’t just stop at the subject of The Boy Who Played Guitar, either. ‘Do you fancy doing the Thought for the Day slot, as well?’ she asks. I gulp. ‘Sure,’ I croak, but it’s all okay. Claire asks me five Gloucestershire-based questions and I answer them best I can. When we are done, she says each one of my thoughts will air every day on the Breakfast Show for a week. I am beyond chuffed. It gets to Friday, and as I turn to Twitter, I get a lovely #ff message from Claire Carter, saying kind things about me. It almost makes me cry. Smiling from ear to ear, I tweet back and then stick the kettle on. Switching on my iPad, I click on to Kindle and spot the Karen Brady book. ‘Plan to win,’ I say to myself. The kettle whistles, and I grab the tea bags. Whatever I plan to do, I’ll just make a nice cup of tea first. Tired from writing or working? What helps you to keep going? Need tea or is coffee your thing? Pop on a comment and let me know. Thanks!